Taimur Ali Khan once again wins the frame with his lush pink cheeks as he sits on the lap of beautiful Kareena Kapoor. 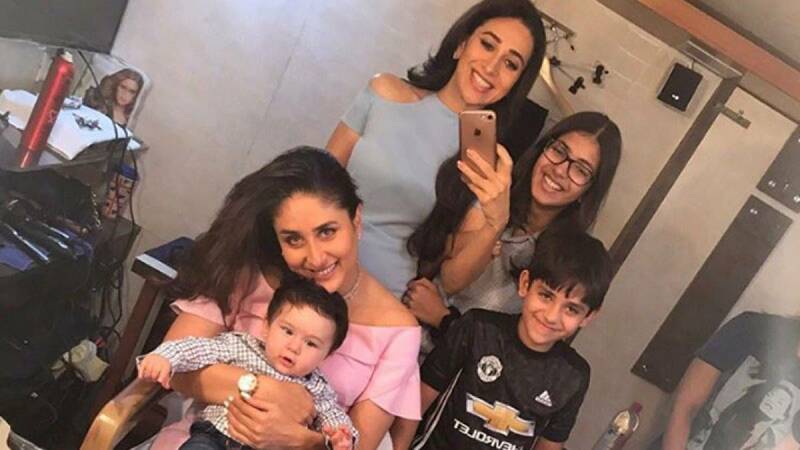 Karisma clicked the picture as her kids Samaira and Kiaan joined the frame with a smile. The star sisters were shooting for an upcoming project when they clicked these photos. Kareena Kapoor, who is back from her pregnancy leave, will be seen next in upcoming movie 'Veere Di Wedding' that also stars Sonam Kapoor, Swara Bhaskar and Shikha Talsania in the pivotal roles.